I had not been to a UHPH before, and so it was rewarding to hear papers delivered by people whose work I am familiar with but have never had the opportunity to encounter in person. Another benefit of the UHPH conference is that all papers are refereed and proceedings are then published. I have previously read UHPH conference proceedings, and these are a valuable resource of Australian urban history, much of which does not appear elsewhere. 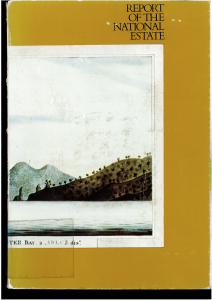 A couple of months ago the proceedings from the Gold Coast were published—including as an eBook. This blog post is on my paper. Most excitingly, for me anyway, is that this is the first refereed article that I have published that directly draws on my PhD research. As the conference was held in Queensland, I presented a paper on Brisbane and the Gold Coast. I drew from the Inquiry into the National Estate, 1973–4, which was initiated by the Whitlam Government to investigate Australia’s heritage. The inquiry embodied the contemporary progressive environmental zeitgeist. Its published report found that ‘The Australian Government has inherited a National Estate which has been downgraded, disregarded and neglected’. As part of its deliberations, the inquiry advertised for public submissions. It received many more submissions than expected: over 600, of which approximately 200 related to the Australian city. (The submissions are at the National Archives of Australia.) These urban submissions were prepared by various individual urbanists including scholars and architects, professional organisations, government departments and businesses. My focus on the Queensland submissions yielded a number of insights that challenge the dominant view of heritage in Brisbane and on the Gold Coast. In the words of historian Peter Spearritt in 2006: ‘heritage hasn’t counted for much in Brisbane’. At the level of micro analysis, these submissions to some extent challenge this writing off of urban heritage in the Queensland city. I go on to examine ten submissions in the article, which I summarise below. From the Gold Coast city council, the emphasis was exclusively on natural heritage, and how it might be at once conserved and exploited for the purposes of tourism. Unlike every other state capital municipal authority, the Brisbane City Council made no submission. Submissions were received, however, from a number of concerned local Brisbane individuals, along with Stanley Hancock (founder of the ‘The Earlystreet Village’, an open-air museum), the Communist Party, and the National Trust. In the foreseeable future, every square food of the inner city will be “re-developed” and there will be nothing left of Brisbane’s “ancient” buildings. These are the signposts in History in their way, and without signposts we do not know where we have been, where we are, or where we are going. Anzac Square: ‘now-doomed’. From the inquiry report. 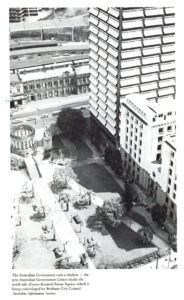 At this time, the heritage conflict over ANZAC Square was raging. Three separate submissions demanded that this civic memorial space be preserved. 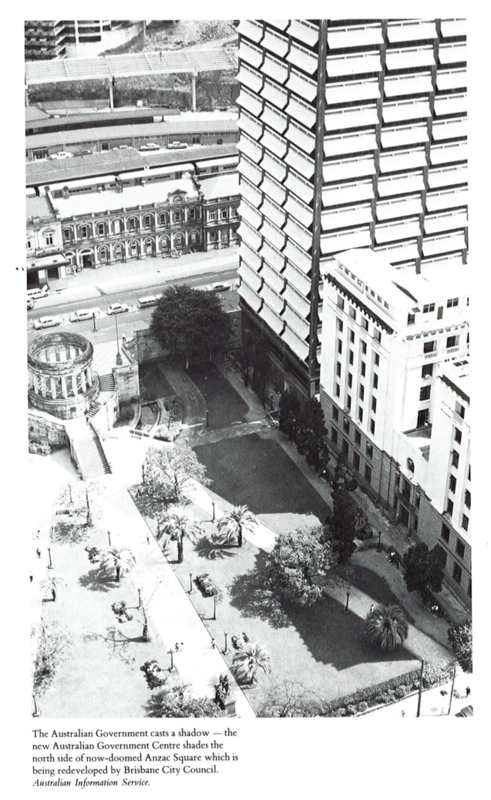 According to the National Estate report, however, it was the ‘now-doomed Anzac Square’. This claim of ANZAC Square’s demise turned out to be greatly exaggerated. The various submissions from the Queensland National Trust addressed a number of places including ANZAC Square. After examining the submissions in further detail, I then briefly considered how the Inquiry treated these Queensland submissions. In an early unpublished draft of the inquiry report, Queenslanders apparently only had ‘sparse appreciation’ for their built heritage. This was certainly a patronising sentiment. The inquiry itself seemingly wrote off Queensland and its heritage, despite the various engaged submissions. I will write about the broader national treatment of the submissions by the inquiry down the line. This was an interesting prototypical case of the regulating of heritage: the privileging of particular heritage voices, and so heritage communities, at the expense of others, by a government constituted body. Some heritage voices were more valued than others. When it came to the Queensland city, my paper ultimately sought to question how we determine what a heritage consciousness is. There was clearly a heritage consciousness amongst certain sections of the community during the early 1970s, particularly in Brisbane: before the infamous nocturnal demolitions of the Bellevue and Cloudland Ballroom a few years later, over which the broader urban community in practice had little influence. As I conclude, ‘The Inquiry momentarily revealed a genuine everyday concern for urban heritage in 1970s Brisbane and foreshadowed the peculiar place that heritage would later hold on the Gold Coast’.